The Russian River has been a favorite destination for generations of San Franciscans looking to get away from the rolling chill of the seasonal fog. It’s also a popular get-away for inland Bay Area residents looking for a watery escape from the summer heat. But for people more familiar with the middle stretches of the river, venturing into the lower Russian River might offer a surprise or two. Exploring the lower Russian River, from Duncans Mills to Jenner by the Sea, you are just as likely to meet animals such as North American River Otters, Harbor Seals or Pacific Pond Turtles as you are to see another person on the river. Bird lovers marvel as Barn Swallows zip by overhead, Osprey call from their nests and Great Blue Heron fish in the shallows. It is also an excellent place to study the river’s ecology. Since all the runoff in the watershed, from pristine wilderness to agriculture and developed areas such as Santa Rosa, makes its way to and through this one spot, scientists can use the river as a living laboratory for how our human activities affect the water quality of the ecosystem. Location and Directions to Duncans Mills & Jenner. Traveling North on Hwy 1, Cross the Russian River at Bridgehaven, make right onto Hwy 116 toward Russian River Resort Areas and continue upriver 4 miles to Duncans Mills. To get to Jenner, make a left after the bridge and travel up Coast Hwy 1 for one mile. Public access to the Russian River is surprisingly limited. 95 percent of the entire watershed is private property. Professional river guides and outfitters can make arrangements for the start and finish your trek and can supply shuttle, and portage for your boats. Take-out is at the Jenner boat launch near the Visitor Center in Jenner, CA, at the mouth of the Russian River, off HWY 1. There is no fee and ample parking is available. Another option is doing our Exploration in reverse by putting in at the Jenner boat launch, and paddling up river to Duncans Mills. We were guided on our Exploration by Suki Waters of WaterTreks EcoTours in Jenner, CA. Suki is a local guide, naturalist and kayak instructor whose roots in the area go back generations to her Native American ancestors. She has been working with the public in outdoor recreation, education and safety on The Russian River since 1979. WaterTreks provided us with kayaks and gear, as well as safety, expertise and fun company on the river. Kayak and Canoe rentals at Duncan’s Mills, CA. Russian River Outfitters can also provide experienced river guides and instruction, as well as a shuttle service and boat portage. If you don’t have your own gear, your professional river guide or outfitter can supply boats, paddles, life vests, dry bags and other equipment you will need. You should plan to supply your own enthusiasm, curiosity and sense of adventure. The Russian River is classified as class 1 waterway, meaning it is mild. However winds, tide, and currents can be unpredictable. 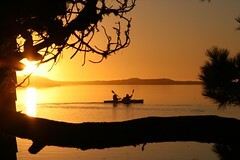 Kayaking is not without risk, it is highly recommended that everyone wear a personal flotation device. Even in the summertime, the wind can come up and the fog will roll in on the coast. The lower Russian River can turn quite chilly, even when it is warm inland. You will get wet. It is recommended to wear layers and a waterproof outer shell. Cotton clothing is not recommended as it tends to hold water and pull heat from your body when soaked. Water wicking fleece or other material is best for warmth. Shoes, such as sport sandals, that won’t get waterlogged are suggested. Bring sun protection. And a good tip is to have a warm set of clothes to change into after your day on The River. Keeping yourself fueled and hydrated is important You will be on the river for a few hours without access to resources. Bring water and some snacks packed in watertight bags or a small cooler. Cell phone coverage is spotty at best in this section of the Russian River but it is still recommended that you keep a cell phone handy in case of emergencies. On the other side of The River from Jenner, is Sonoma Coast State Park. Mostly known for its beaches, one of the highlights for those who love the outdoors is Pomo Canyon. A former Pomo-Miwok trade route, this 3 mile hike takes you from the redwood glens near Willow Creek, up and over the grassy hillside and down to the coast at Shell Beach. It’s considered by many to be one of the prettiest hikes in Northern California. Over 800 acres of magnificent Sequoia sempervirens, commonly known as the Coast Redwood are preserved near Guerneville, CA. Armstrong Grove is a favorite place to escape the heat of summer and bask in the shade of an old growth forest. The ancient Coast Redwood is the tallest living thing in the world. Some coast redwoods are more than 2000 years old and tower over 350 feet. Armstrong Redwoods State Reserve offers self-guided nature trails, a visitor’s center and a variety of picnic facilities. The tallest tree you’ll encounter in the park is called the “Parson Jones Tree” measuring more than 310 feet in height. The oldest tree here is the stately “Colonel Armstrong Tree,” estimated to be over 1400 years old. It is named after a benevolent lumberman who chose to preserve this portion of the park in the 1870’s. Special thanks to Jenny Donovan and Rich Lawton of the California State Parks, Jessica Martini-Lamb of the Sonoma County Water Agency, as well as Michele Luna and Annie Cresswell from the Stewards of the Coast and Redwoods for assisting us on this project. And a special thanks to our guide, Suki Waters of WaterTreks EcoTours, for taking us on this wonderful paddle and showing us all that the Lower Russian River has to offer! The Russian River begins its ramblings in the northern California redwood forests of Mendocino County, gently flowing south through Sonoma County, past lush vineyards and the towns of Geyserville, Healdsburg and Guerneville, before turning and winding its way to the Pacific Ocean. The river is a popular summertime destination for Bay Area residents and is also home to a vibrant and diverse wildlife community. One of the wildest spots on the main stem of the Russian River is near its mouth where the river meets the sea. Here at the estuary the waters widen and the influences of two dynamic ecosystems merge. We have explored estuary environments before, discovering their beauty, learning about the fluctuating environment, the impact of human interaction and the challenges of restoration. But for this Quest Exploration we trade in our walking sticks for kayak paddles. The only way to be fully immersed in the river environment is to take to the water. A young steelhead jumps at a dragonfly, an Osprey lands in its nest above, a family of river otters frolics along the riverbanks. The river is a verdant but fragile part of California’s natural heritage. Exploring the lower stretch of the Russian River, from Duncans Mills to Jenner, provides a micro-climate glimpse of the varied river terrain; winding from the warm inland mountains and forests, past breezy oaks, willows and grasslands, to fog-draped Tule marshes and coastal dunes. And as we slowly drift down the river, the aquatic ecosystems are changing too, from fresh to salty brackish water. The Russian River Tule Perch, (Hysterocarpus traskii pomo), is the only genetically endemic (biologically native) fish in the Russian River. When we think of rivers we usually just think of the main stem, the stream we see flowing in the waterway. But rivers begin at the tops of mountains. The whole area of land that drains into a river is called the watershed. The Russian River watershed encompasses 1485 square miles of mountains and valleys, forests and agriculture, cities and towns, 95 percent of which is private property. All of the water running off this land makes its way into and down the 110 mile stretch of the main stem before finally meeting the Pacific Ocean at Jenner, California. The river supplies drinking water for over a half million people in Mendocino, Sonoma and Marin counties while during the summer it is also one of the most heavily used rivers for canoeing and kayaking in the nation. The river provides critical habitat for birds and other wildlife, as well as many species of fish including three endangered salmonid species and the endemic Russian River Tule Perch. The area of the river that we are exploring is located within the coastal fog belt of the outer North Coast Ranges. Here cool, moist, maritime conditions contrast the warmer dryer continental climate of the inland watershed. Tree species such as Redwood (Sequoia sempervirens), Douglas Fir (Pseudotsuga menziesii), Tanoak (Lithocarpus densiflorus) and Pacific Madrone (A. menziesii) dominate the forested landscape. The south-facing slopes and ridgelines are quilted with upland Coastal Prairie that serves as a reminder of the once vast and diverse grassland that stretched along the northern California Coast. Old-timers tell tales of the Russian River at a time when the redwood trees growing along the riverbanks were so huge, their branches stretched across the entire river, touching in the middle, and creating a shaded tunnel that the cool water gently flowed through. Today most of the big trees are long gone, but the second and third-growth timbers still provide homes for waterfowl, eagles, owls, osprey, heron and a host of other birdlife. Native riparian plant communities support a high level of biological diversity and are particularly important to the life cycle of fish such as endangered salmon. The native vegetation also helps control erosion during the winter flood stages and can mitigate over-sedimentation of the river. On our paddle we glided past an osprey and great blue heron roosting site that is testament to a thriving river environment. In one 50-yard stretch we could see at least four large osprey nests, each with a courting pair calling out to one another as they were busy rearing this year’s young brood. The success of these fish-eating raptors, at the top of the river food chain, is encouraging, showing a thriving food-web of fish and invertebrates in the aquatic ecosystem below the nests. As we enter the estuary and approach historic Penny Island, The river begins a transformation both readily seen and unseen. Scientists from the Sonoma County Water Agency and National Marine Fisheries Service are now actively studying this region. 12 data collection stations have been installed in the estuary, taking readings of the salinity and water temperature and measuring the levels of bacteria and oxygen in the river. The scientists are also working with the USGS to test for pharmaceuticals, heavy metals and wastewater residue in the estuary. 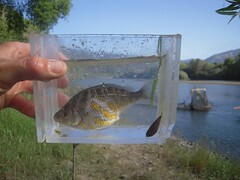 The Russian River estuary has an incredibly rich biodiversity. Over 50 species of fish have been identified in the lagoon, including Chinook Salmon, Tule Perch, Starry Flounder, American Shad and Bay Pipefish. The estuary is a nursery and particularly important for fish such as young steelhead who use this area to grow and adapt to saltwater before entering the ocean. It’s this mixing of two distinct ecosystems that makes the estuary environment so vibrant; a confluence of life where an upriver animal such as the Northern River Otter, might interact with an ocean species such as a harbor seal. Join our Lower Russian River photo group on Flickr to share your photos of this amazing place. UPDATE: “The dense forests of redwood, oak and Douglas fir that once covered much of Sonoma County have for many decades been giving way to pastures, orchards, subdivisions — and vineyards. I’ve seen golden eagle nests in the area around Willow Creek also.